Mini Paper Trimmer 4"X6" - DARICE-A paper trimmer that is the perfect size for cropping your photos! 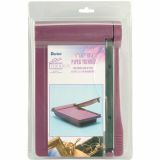 4x6 in size so you can trim all of your 4x6 photos with ease! A deep plum color with matching swing arm. Warning: not a toy. For ages 6 and up.